As you know, the Secretary‑General was in Colombia over the weekend. He is now back in New York and we expect him back in the office shortly. 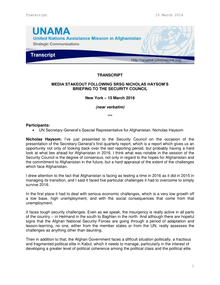 In Afghanistan, our humanitarian colleagues tell us they’re concerned by the intensified fighting between the Taliban and Daesh‑affiliated Islamic State‑Khorasan (IS‑K) in Khogyani district, in eastern Nangarhar province, which have triggered new displacements. According to local sources, there are more than 2,000 newly displaced people, adding to the 5,000 people that were displaced by the fighting that started five days ago. In Afghanistan, our humanitarian colleagues inform us that armed clashes between the National Defence and Security Forces and Non State Armed Groups continue around Kunduz city and are driving people to leave their homes. Jens Laerke, for the Office for the Coordination of Humanitarian Affairs (OCHA), said that many had condemned the lethal bombing of the MSF hospital in Kunduz, in North East Afghanistan, including the Under-Secretary-General for Humanitarian Affairs and Emergency Relief Coordinator, Stephen O’Brien, in a statement issued on 3 October. Dan McNorton, for the United Nations Refugee Agency (UNHCR), said the number of people displaced by the current offensive conducted by Pakistan’s military against Taliban militants in North Waziristan Agency continued to rise. The role of transparent resource management in conflict prevention, the situations in Mali and Somalia, and a debate on sexual violence in armed conflict would be among the Security Council’s top priorities in June, the Permanent Representative of the United Kingdom said at Headquarters today, briefing correspondents in his capacity as the 15-member body’s President for June. Forging greater ties between the United Nations and the League of Arab States to address Middle East turmoil and working closely with their new Joint Special Representative on the crisis in Syria would be among the top priorities of the Security Council in September, the Permanent Representative of Germany, whose delegation holds the Council’s rotating presidency for this month, said today. The members of the Security Council condemned in the strongest terms the coordinated terrorist attacks on 14 and 15 August 2012 in various parts of Afghanistan, causing numerous deaths and injuries of mostly civilians. RIO DE JANEIRO, 22 June — High-level officials of nearly every Member State meeting in Rio de Janeiro, Brazil, renewed their commitments to ensuring an “economically, socially and environmentally sustainable future for our planet and for present and future generations”, as the United Nations Conference on Sustainable Development — Rio+20 — closed this afternoon. Two gorgeous little girls of an Afghan family that had returned from foreign exile would have had a shining future if they were born in the developed world, an Afghan-born novelist and goodwill envoy for the United Nations refugees agency said today at a Headquarters’ press conference. La Représentante spéciale du Secrétaire général pour les enfants et les conflits armés a indiqué aujourd’hui que les Forces armées syriennes, les services de renseignement syriens et les milices Chabiha, figuraient désormais sur la « Liste de la honte » dans la dernière édition du Rapport du Secrétaire général sur le sort des enfants en temps de conflit armé*, laquelle a été publiée aujourd’hui. As the Security Council navigated “a very packed schedule” in June, it was critical for the body to maintain “unswerving support” to international mediation efforts in Syria in the face of terrible recent events, the representative of China, which hold’s the Council presidency for the month, said this afternoon. Laying out the programme of work of the Security Council in May, under the first presidency of Azerbaijan, the country’s Permanent Representative this afternoon vowed to work to maintain unity among members for addressing the conflict in Syria and the many other complex situations the body was seized with. “As President, I will do my best to keep unanimity and consensus approach to that kind of sensitive issue,” Agshin Mehdiyev told correspondents at Headquarters, saying that the presidency ushered in an “historic period” for his country. An immediate ceasefire was critical to solving the crisis in Syria, the Secretary-General of the Organization of Islamic Cooperation (OIC) stressed at a Headquarters press conference today. “We cannot reach hospitals, displaced people and those in need,” Ekmeleddin İhsanoğlu said. Outlining the OIC’s initiatives in the areas of peace, security, and humanitarian operations, he said the situation in Syria was a matter of great concern, adding that a humanitarian mission was scheduled to arrive in Damascus today. Challenges and opportunities in North Africa and the Middle East and the situations in Somalia, Haiti and Afghanistan would be highlighted at the Security Council in March, the permanent representative of the United Kingdom, which holds the body’s rotating presidency for the month, told correspondents this afternoon. The Security Council work programme for December would contain 18 open meetings — including 2 debates, 11 briefings and 5 meetings to adopt draft resolutions — as well as 20 closed consultations, Council President Vitaly Churkin (Russian Federation) said at Headquarters today. At a press conference where he briefed on his country’s December presidency, he said the Council would adopt about 10 draft resolutions in addition to issuing a number of presidential statements, expressing hope that the Council would have concluded its work by 22 December. While remaining seized of ongoing situations of concern in Libya, Syria, Sudan, South Sudan and elsewhere, the Security Council planned to focus on preventive diplomacy when world leaders arrived for the opening of the upcoming General Assembly session, Nawaf Salam ( Lebanon), Council President for September, said at Headquarters today. After eight years of occupation by Coalition forces, said experts today from the United Nations Working Group that monitors mercenaries and mercenary-related activities, the security sector in Iraq faced a vacuum that opened the door to private military and security companies.